I would have been hard pressed to have picked any other subject than her two loves: Charly, the spunky Jack Russell terrier & Wilbur, the soulful Basset hound. Luckily for me, Ruth has participated in Pets on Quilts at Lily Pad Quilting for a few years and there were a lot of great photos on her blog, so I was able to keep my plans a complete secret. We had decided on 6" x 9" mug rugs, but mine turned out a little larger at 7" x 10", if I recall correctly. 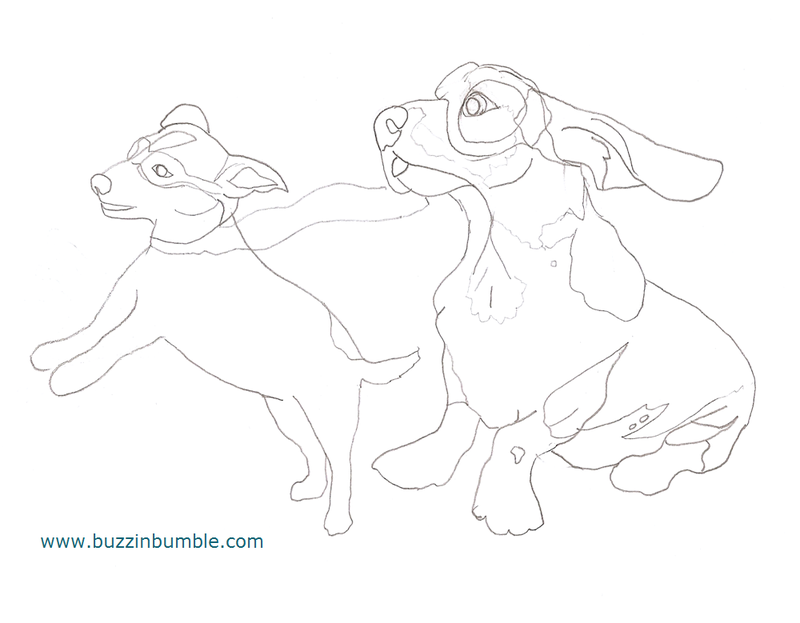 Here is my preliminary sketch. I had initially thought I would do them wearing aviator goggles. I decided to forgo that part, as their faces were too cute to hide. I had to change Charly's legs so she could sit in the wagon and hold onto the handle. After all, a Jack Russell has to steer. I don't know which is truer colors, the first photo at the top, taken outdoors, or this indoor shot. I took the pictures rather hurriedly. The outdoor shot, in natural light, is definitely clearer. I knew Ruth would be super generous, because that is how she is, so I made sure to include some fun extras in her package. She has plans to do a Polaroid quilt project, so I sent along a couple dozen of the center squares and some pretty feather fabric. For those of you who like to scrutinize whenever I make something with applique (ahem...Maryse LOL) Yes, I used my no-fray technique for the appliques. We've had quite a bit of excitement this last week, because the AQS editorial team let me know they have started editing my upcoming book Crafted Applique'..... New Possibilities So now I feel a lot more confident that it is really going to happen! (Plagued with insecurities much?) It is due out on April 12th, 2016 and is now available for pre-orders. Adriana, the proofreading editor said that the cover tested very positively with their marketing department. :) So, it looks like this really will be the cover, which I'm very happy about! It's a shot of one of the projects, but I'm not sure if I can say what it is, so will keep it a secret for now. I probably won't be posting again until Cheryl's Best of 2015 Linky Party, which runs from December 26th til January 2nd, at Meadow Mist Designs. I hope to see you all there! Until then, I wish you all a blessed Christmas and a happy holiday season! 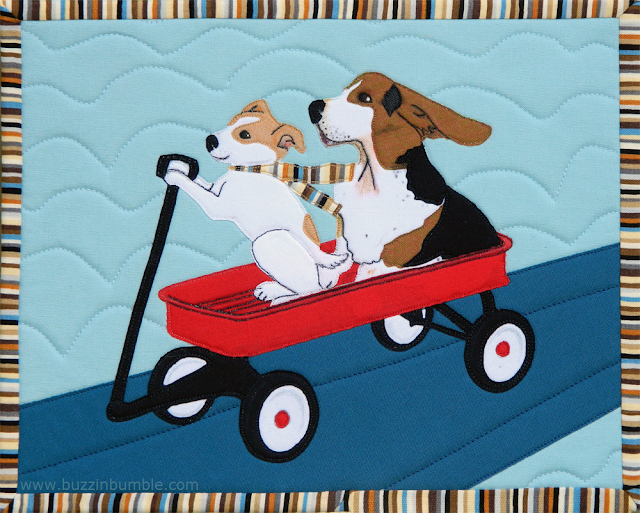 That is one super-cute mug rug! Love the fun fabrics you included with your swap. Congrats on the book becoming one step closer in the process. Great cover! Lara, the mug rug for Ruth was so perfect! I know she loves it (did she post about it the instant she received it?!?!). :) And congratulations about your book - that is very exciting news! OMG what a great mug rug! I don't think you could have made a better choice for Ruth. Congrats on the book! Oh Lara I love the finished mini but I love your sketch too - Charly looks like superdog! thanks for sharing more of how you made this and I can't wait for your book! This is amazing, Lara! First, I thought the two dogs were on a panel. Too perfect to be appliqués. Now, I'm more then ever curious about the content of your book. This mug rug shows great talent. The design, the color mix, the stitching, the fact that it looks so flat and crisp. I love it! Lara, what a great mug rug! I hate to call it a mug rug, though... it's a mini masterpiece! I'm looking forward to seeing you book in print! Glad the process is moving along. Merry Christmas! Oh Lara, that is so cute, you have me smiling and my mind just came up with so many ideas, I really love this. Is that a free hand sketch or do you use a light box? Very Sweet pictorial of those pups! Merry Christmas! What a portrait of the pups you have created!!! And you are using your new technique !!! I love this design if these two .... You captured their personalities in a fun way!! Yay!! For the release date!!!! Congratulations ! I can't wait to see your book and learn your no fray technique!!! Your cover is beautiful!! Your technique must be amazing to achieve the fine detail coupled with your great drawing skills!! How fun! I am so excited that your book is happening, and look forward to it's release!! Congratulations! This is the sweetest mini Lara! I cannot wait to read your BOOK! I am blown away at your talent!!! I never would have guessed that was applique'. I'm very interested in your technique and will look forward to getting a copy of your book. Congratulations, by the way! My goodness you are talented! Your mug rug looked like a printed panel when I first glanced at it. Your artistic talent is amazing! (Maybe some fabric design is in your future.) I'm so happy to hear that your book is moving forward and can't wait to get my hands on it. Will you have copies that you can autograph and buy from you? Have a wonderful holiday and stay warm! Your mug rug is awesome!! Congratulations on the book. That mug rug is absolutely fabulous! I love all of the perfect detail you have put into it. I am making bets that it will not be used. ;-) I also like the mug rugs that you received. The book is making great progress. I love the cover. Have a wonderful Christmas. What an adorable mug rug! You made an excellent rendition of the pups, and they look like they're having the best of time in the wagon! You put together a lovely swap. Congratulations with your upcoming book! Perfect piece for the cover with vintage caravans now being all the rage. Have a very Merry Christmas and Happy New Year! I was thrilled to see this in my Facebook feed, Lara, and knew recognized Charly and Wilbur right away. This is beyond cute! Love that red wagon. And congratulations on the new of your book! So happy for you! Going to miss you over the Christmas Holidays. Will be thinking of you.... And wishing you and yours a very Merry Christmas. See you at the linky party! so adorable! I, too, can't wait to see your book and your techniques. It looks so nice. So very cute. I love how the binding matches the scarf. Good luck with your book. The cover looks great. This mug rug is beyond adorable! I wouldn't be able to use it! Such a wonderful mug rug. Your work is fantastic and I can't wait for your book to come out. How do you like your name "in lights" on the front? So so c o o l! Lara that mug rug is so cute. You are quite the artist too! I'm sure Ruth was doing a happy dance when she got her pkg. Congrats on the book and the adorable cover. I've added it to my wish list. I also hope to post in Cheryl's Best of 2015 party. See you there! Such a cute and amazing mug rug. Your applique technique just stunning <3. I am so happy to hear that your booking is coming out in the Sprint and can't wait to get hold of copy. 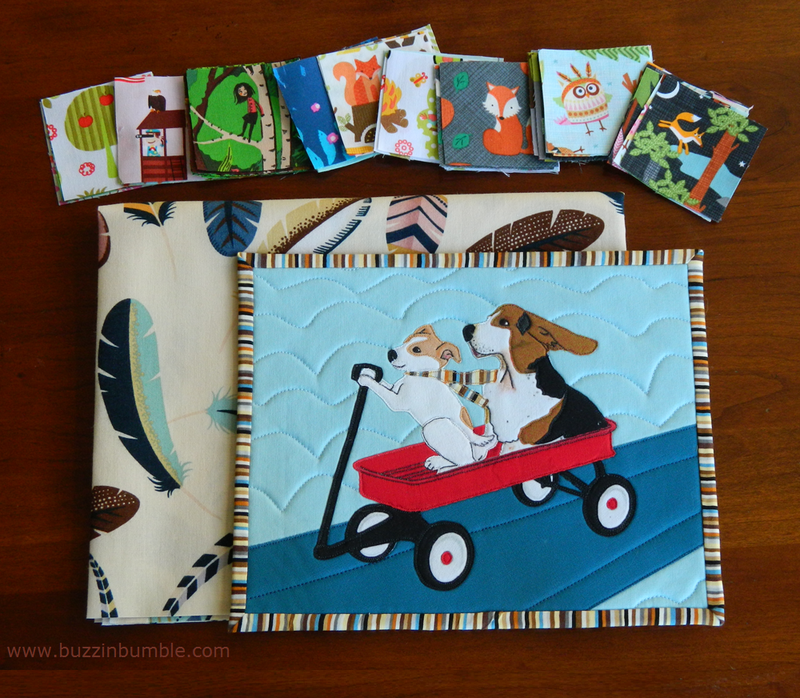 Cute additions to your quilty friend's package. The cover of your book looks awesome and the mug rug is amazing! You captured Ruth's dogs perfectly. 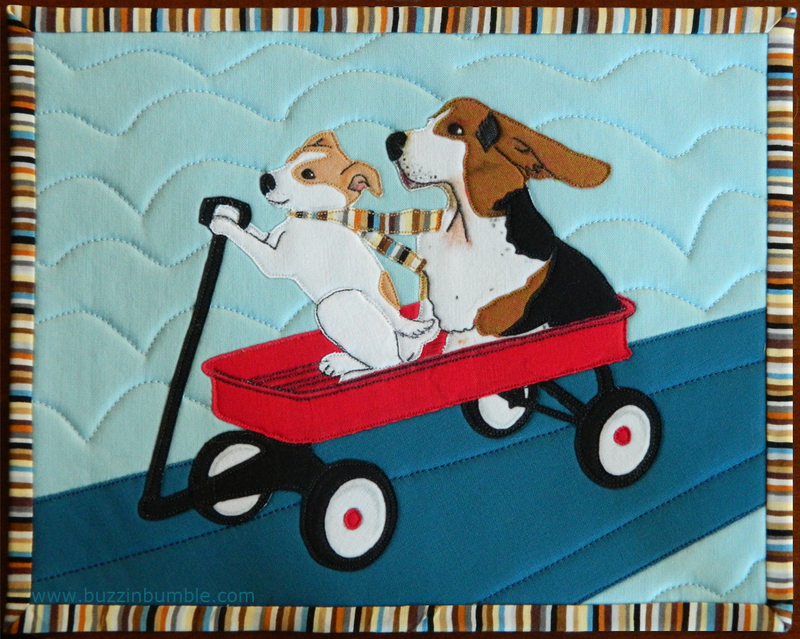 Your sketching and applique of the dogs is fantastic Lara and I am anxiously awaiting your new book!!! Congrats again! The mug rug turned out fantastic. You are a true fabric artist right down to the sketching for the mug rug. OMG!!!!!!!!!! ADORABLE!!!! Lara I'm soooo excited for you about your book! !Please do include me in your book launch. Blog hop??? So happy for you. Congratulations on your upcoming book. Fabulous! The mug rug is ver adorable. This mug rug is gorgeous, Lara. What a talent you are. A hug. You have some amazing skills. Those dogs are darling! And I'm excited for you about your book. Perfect for Ruth and you are so clever that you can make something like this! 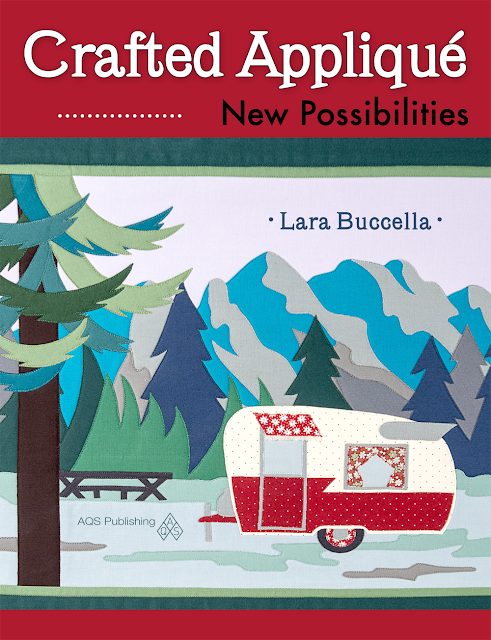 I'm glad your book is progressing well; I love that cover - have a secret longing for a caravan like that in my garden. Have a wonderful Christmas! Such a great mug rug! Their ears seem to fly behind them with speed :-) I'm sure you can't wait to hold that book in your hands for real! So exciting! What a great mug rug!!! That was so creative of you! And congrats on your book - you must be flying high! Lara, I love the mug rug for Ruth! You are so clever! I already saw it and it looks great! Thumbs up for the cover! A great swap, love both the rugs andyour applique is amazing :-) How exciting that your book is getting closer to becoming a reality! Well done!! I hope your Christmas was merry and best wishes for a very happy 2016! I agree... a "mug rug" just isn't good enough for this little piece of art! It's so cute :) Very excited for your book, woo hoo! !